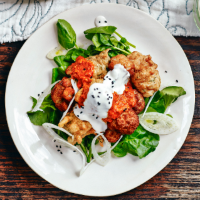 In Lebanon, cauliflower is traditionally fried and served with tahini, lemon juice and garlic. But lately I’ve been enjoying a Syrian dip called muhammara, made with peppers and paprika. 1. The morning of the party, simmer the cauliflower in salted water until just tender (about 4-5 minutes); drain and dry on a tea towel. 2. To make the batter, whisk the egg with 100ml water, then add the flour, sumac, cumin and salt. Whisk until smooth, then chill. 3. For the pepper sauce, put everything in the small bowl of a food processor and purée to a slightly coarse texture. Spoon into a bowl and stir in enough cold water (about 2-3 tbsp) to give the mixture a thick but pourable consistency; season. 4. When you’re almost ready to serve, pour the vegetable oil into a deep, heavy-based saucepan to a depth of about 3-4cm, so the cauliflower can fry without touching the bottom. Heat the oil to 180˚C; use a sugar thermometer to test this or drop in a piece of bread – it should brown in 45 seconds. (Alternatively, use a deep-fat fryer.) Fry the cauliflower pieces for about 2-3 minutes, until golden, then drain on kitchen paper. 5. Next, thin the batter with a little water to the consistency of double cream, then beat in the bicarbonate of soda and stir in the herbs. Dust the cod pieces with flour and coat in the batter. Scoop them up with a spoon, one at a time, then lower into the oil. Fry in batches for about 2-3 minutes, until golden and cooked through. Drain on kitchen paper while you fry the remainder. 6. Serve the cauliflower and cod with watercress and finely sliced fennel, if liked. Spoon over the pepper sauce, plus a little tahini let down with water and scatter with a few nigella seeds, if liked.